Thomas Charles Reed | Launceston Then! Thomas was born in 1853 to Thomas and Mary (nee Hutchings) Reed at St. Thomas, Exeter. Thomas was the eldest of six children, having two brothers Frederick and Edwin, and four sisters, Bessy, Lucy, Annie, and Emma. His father ran his own currier and leather business something that the family had been in for generations, it was said that the family had provided some of the grain for the Nelson’s force at Trafalgar. He married Hannah Harper in 1877 in London. The first of their three sons was born in 1879. In 1881 they moved to Launceston, residing at Clifton Villa, Horse Lane with Thomas taking up employment as a manager with the tannery company Messrs Pethybridge. 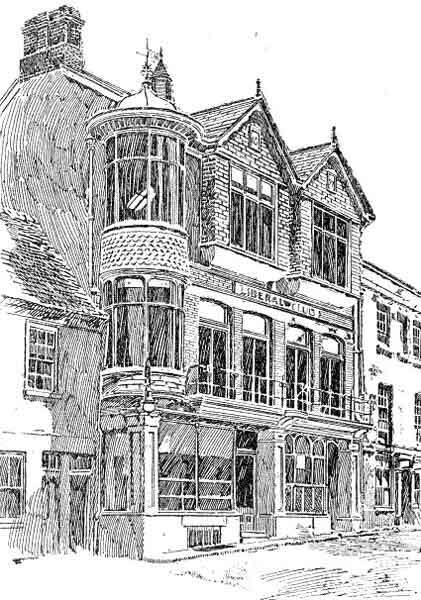 He soon became a partner and became managing director of the newly named firm of Messrs Pethybridge and Reed and Co. By 1891 the family had moved to Wembury, St. Stephens Hill. In 1895 Thomas was elected to the Launceston Town Council and was chosen to be its mayor in 1905. In 1911 he was elected an Alderman. Thomas played a major role in the acquisition of the Borough Standard, of the grant of which, with its ‘badge,’ ‘Royale et Loyale,’ by the Earl Marshal, which was the first to be granted to any Corporation. 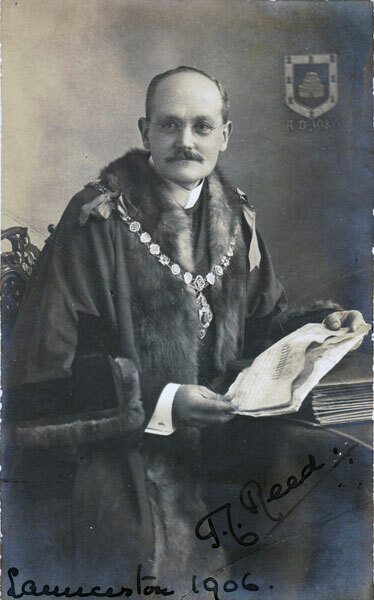 In 1906 he was made a Justice of the Peace for the borough, and he was also a keen supporter of the erection of the Passmore Edwards Free Library at the bottom of Northgate Street. He was a strong Liberal and for several years was the President of the Launceston Liberal Association, which was at the time of the new Liberal Club building at the top of Northgate Street. Before the first world war, he proved to be a worthy opponent to his political rivals, a man of strong conviction. He was a great lover of historical research, and held an extensive knowledge of Launceston’s history. Like many Liberals of that time, Thomas was a staunch Methodist and a member of the Wesleyan Church in Castle Street. For more than 30 years he was President of the ‘Dingley’ Bible Class. With the onset of the first world war, he championed the plight of the Belgium refugees helping them settle into the town and was the hon. secretary of the local refugee committee. Thomas’s health began to fail in his latter years with a heart condition and during the early part of 1917 it became evident to all that it had worsened. He suffered an attack of pleurisy which weakened him and he died on June 1st, 1917. A short service was held at his home by the Revs. T. H. Love and c. M. Draper (Wesleyans), before another service at St. Thomas Church which was conducted by the Revs. E. Drewe (vicar of St. Stephens) and Allsopp (vicar of Bolventor, representing the Rev. J. J. Haworth, vicar of St. Thomas, who had that time was in France). Preceded by the police and mace bearers, the Mayor (Dr. Willie Thompson) and corporation attended in State. Muffled peels were rung out and afterwards he was interred at St. Thomas Churchyard.